Even though your deck or other wood structure has been protected it doesn’t necessarily mean some boards, balusters or rails may not need some adjustment, replacement or tightening up. By inspecting the structure every 2 to 4 years when maintenance is due we can head off far more expensive repairs down the road and offer suggestions to keep your structure beautiful! 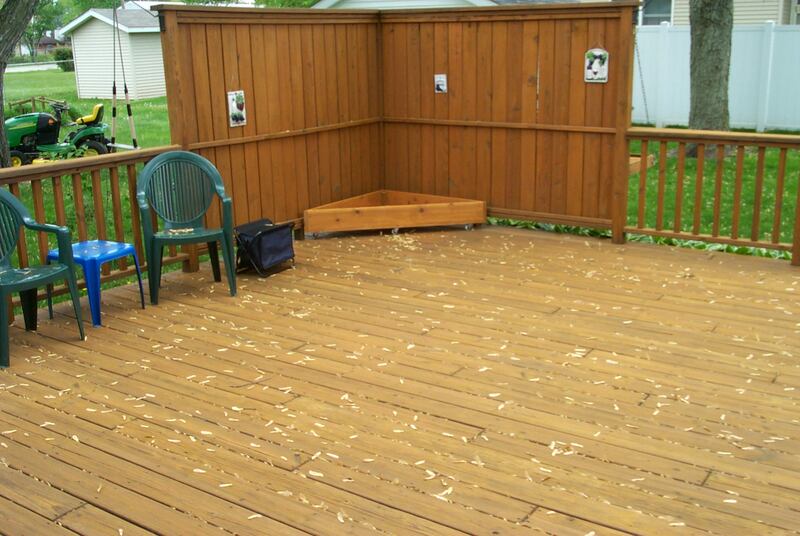 At this point the deck or other wood structure has a detergent based cleaner applied to it to help loosen the dirt and grime that has settled. This will also remove any accumulated surface mold or mildew, algae and other debris in order to get the wood surface ready for a maintenance application of our TimberSeal Pro-UV Oil finish. As years go by Mother Nature will take her toll on any surface. Even a well protected one! Leaves, acorns and general fallout tend to darken the surface of any finish. Our maintenance brightener removes stubborn tannin stains and further opens the pores of the wood so we can apply additional finish for the best possible end result! After 2 to 3 day drying period crews return to apply our TimberSeal Pro-UV Oil finish in your original color to your deck or other wood structure. Our goal is to replenish the oils lost from the several seasons of weather the surface has been exposed too and rejuvenate the color and beauty of the wood while adding layers of protection to it from the elements! Following the application process we recommend a 24 to 48 hour period before use. That’s it! That’s truly how easy and straight forward deck and wood maintenance can be. No stripping, no sanding, no grief! Rely on TimberSeal and our TimberSeal Pro-UV Oil Finish to keep YOU outdoor wood projects beautiful and well protected!